This is the last Friday Spyday of 2011. Can you believe we are half way through this DT term? It's amazing how time flies. 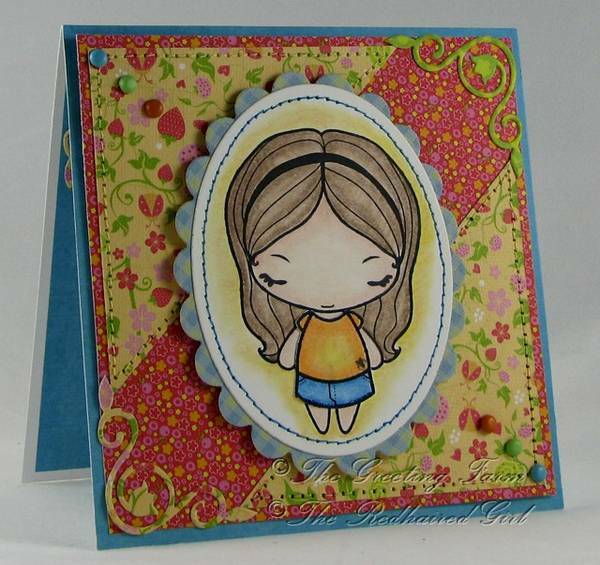 This week's featured card is by Shaela. She uses such great colors and Flirty Anya is just too cute. 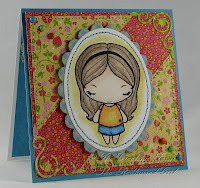 My base is Very Vanilla with layers of kraft and Mamarazzi by Bo Bunny. 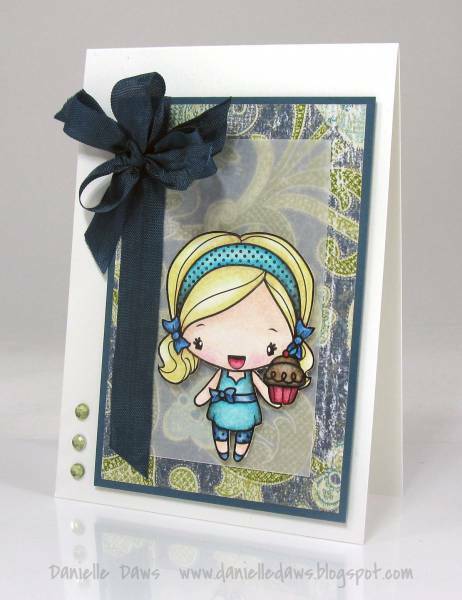 The border punch is Martha Stewart and the sentiment is punched using the decorative label punch from SU. The image is Oliver from TGF's OA Journey. Isn't he just darling? I love his little vintage vagabond look. He is colored in copic and mounted on dimensionals. The last piece is a coin from Tim Holtz. This is the last Heart Journal. I can't believe I made it through all 23 weeks! Honestly, I feel like it is a major accomplishment, so I am excited to share my last entry. This week's theme is "A Letter to Myself." I used Bo Bunny Mamarazzi for the base. Isn't it fabulous? I cut a photo/mirror from thin chipboard and used a square nestabilities to cut and emboss the center. Instead of a photo, I put a piece of foil so to still reflect, but be distorted. I have a hard time with my looks and have never had a positive view of me or my body, so I decided to reflect that. On the left side is my title and along the film strip, I wrote some positive things for me to focus on about myself. The tag next to the "photo" is stamped with $1 set from Target's dollar spot, in Jet Black Staz-On. I added a silver eyelet in place of the one printed on the tag and tied some jute twine before mounting on dimensionals. It's another Monday Funday challenge at the TGF Farm Fresh Challenge blog and I get to host! I hope everyone had a fabulous Christmas (or if you celebrate another holiday). Today's challenge is "Sing A Song" - create a project based on a favorite song or lyric. I left it broad so there is a lot of freedom. 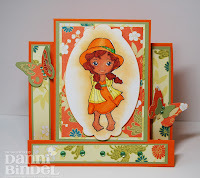 The card base is Whisper White with layers of Old Olive and designer paper from DCWV. The image is Elf Anya and is colored with copics. I mounted it on a die cut with nestabilites classic circles and lacy circles. I tied some bells to twine and cut slits near her hands to look like she is holding the string of bells. I also used a glue gun to add bells to her hat and the bow. Inside is some scraps from the card with the sentiment "Jingle Bells" stamped in Purely Pomegrante using Studio g alphabet stamps from Michael's dollar bin. This week's Spyday comes from a very talented lady at SCS - Beate! She has many tutorials and gorgeous projects that wow me every time. I decided to draw from the colors and the scallops. I wanted to use more than one kind of border punch and had a lot of fun picking which ones. I also drew from the triangle piece by making a multi-pocket card. I started with a base of 5x12, scoring at 4 and 8. I then cut a diagonal piece off from the 4" score to the 12" end. I added an extra pocket behind the shortest piece. At the top, I punched a Martha Stewart punch on Whisper White; folding it as I stitched to give it a gathered look. 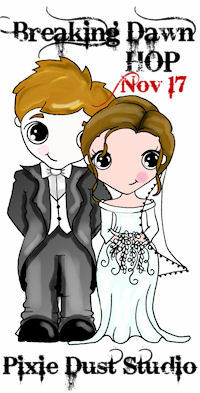 I used the pinking hearts punch in black along the slant. I used a scrap piece of pink heart printed paper to make a background for the middle pocket. The black pocket has a white border using the lacy scallop border punch from SU. 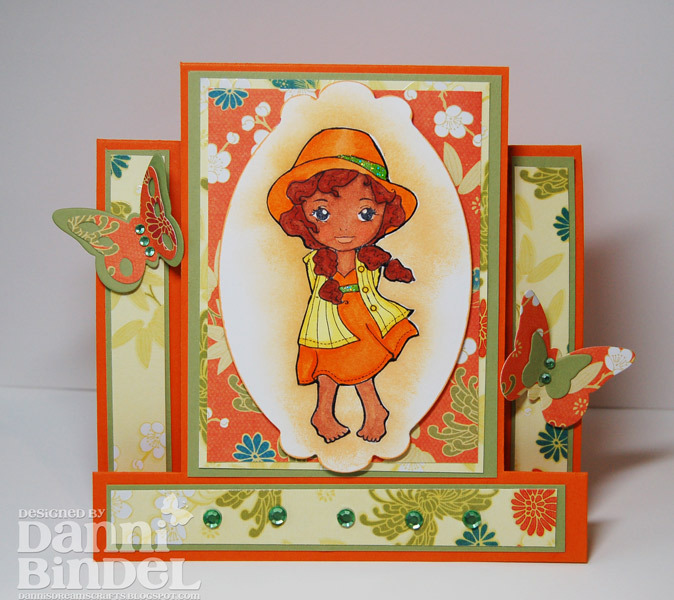 The littlest slant flap is embossed using the snowflake Cuttlebug folder. We're in the last two weeks of Heart Journalling over at The Greeting Farm. I can't believe next week is it and I will actually finish this....Merry Christmas to me! This week's assignment - Music of My Heart. We have been asked to create a spread featuring music in some way. As for me, well, I have NO musical talent - that honor goes to my husband and daughter. I can proudly say my daughter's ecclectic tastes come from me. I love country, oldies, broadway, etc...pretty much anything that is not Death Metal or rap. My MP3 features things like Andrew Lloyd Webber, Seether, Paramore, Brad Paisley, Van Morrison, and Disney - just to name a few. Welcome to the 3rd Annual Customer Blog Hop! This is for the holiday project entry. My project is a butterfly box using SU's Certainly Celery, Whisper White, Recollections robin egg blue, cherry, and designer papers from DCWV's This Christmas stack. The image is from TGF's Tea-rrific photopolymer clear mount stamp set and is colored in copic markers. It was cut and embossed using Nestabilities classic circles and mounted on a lacy circle using dimensionals. The border punch is Martha Stewart's scary fence, but I cut off the bat wings, and added pearls. The finishing touch is a bow tied with a pink button. Inside is a sentiment I typed on the computer and cut out using a Nestabilites die. While the box is a tad time consuming and requires exact measurements, it gives a dramatic effect and is actually easy to assemble. Not only do the participants have a chance to win one of TWO big prizes - one in each category of "holiday" and 'general" project categories. THREE grand prizes up for grabs! Be sure to comment on each participants blog as you hop along and you will be entered to win the third grand prize. Talk about awesome! Now, back to the TGF blog to pick up your next stop! Here we are again! Time to make those last minute Christmas cards! This week's assignment: use Kraft, twine and buttons. The base is cherry with layers of kraft. I used a corner rounder to trim the layers. The image is TGF's Wild Sprout Edward and Camille...of course, they are for Twilight's Edward and Bella...and are colored with copic markers. I added a little heart ornament for Bella to hold. The border punch is Martha Stewart. I stamped the sentiment from SU's Loads of Love in Whisper White on the corner before adding the assembled layers. I wrapped some jute twine around the border piece, adding a couple of little tags with holiday words tied with baker's twine and clipped with a mini clothes pin. I also added a button near the sentiment, tied with a piece of baker's twine and set with a glue dot. Inside, the sentiment and truck are from SU's Loads of Love. The truck is pieced and mounted on dimensionals. The inspiration for my card came while my children watched "The Polar Express. "The base is robin's egg blue from Recollections and has layers of cherry and designer paper from DCWV's This Christmas. The other images are copies of the gold train ticket. 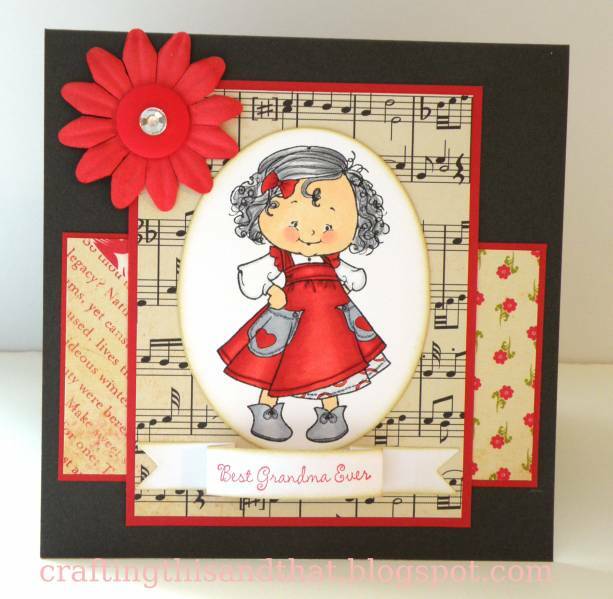 The background is cut using the SU/Sizzix Top Note die. The designer paper layer is also embossed using the snowflakes Cuttlebug folder. Behind the Top Note layer, I have a pull out ticket with the phrase "Believe" punched in it. If you know the story, you know where it comes from. I added a silver bell (also part of the story) and a pull tag to the edge of the ticket. The image is TGF's Special Autumn Anya and is colored with copics, then mounted on dimensionals. Her hat is from Cricut's Pooh & Friends cartridge. The sentiment (also from the story) is stamped on a scrap of blue base in Blazing Red Staz-On, then punched and mounted with dimensionals. Does the bell still ring for you? This month's TGF Farm Fresh Challenge blog Retro Fresh challenge is Tag-It! 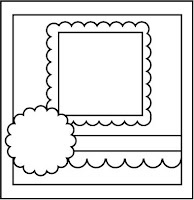 The assignment: create a tag or use a tag on a project featuring a TGF image. I'll be honest, I am not a fan of making tags, but I don't mind using them on something else. Here is mine...another Christmas card featuring TGF's OA Just for You and Tea-rrific sets (tag and swirl inside). Now, the OA Just for You meets the "at least 6 months old" for the Retro part of the challenge, but I snuck in the other set...shame on me! The base is Old Olive with layers of Very Vanilla, cherry and DSP from DCWV and is a gate fold card with stitching around the outer edge of the layers. The border punch is lacy scallop border from Martha Stewart/EK Success. The ribbon is grosgrain from Michael's. Amelia is color in copic. The ground under her feet is done making lots of little dots in several shades of the E range of colors - Sand, Oriental, Chamios, etc. The tag is stamped in Wild Wasabi ink and the snowflake is from the SU Season of Friendship, stamped with Whisper White craft, then sprinkled with red embossing powder. It is punched with a 3/4" cirlce and mounted on a 1" circle using a dimensional. I used a bit of twine to kinda make it look like an ornament. Monday Funday #11 - Oh Boy! Today's Monday Funday is Oh Boy! - create a boy themed card. Head over to the TGF Farm Fresh Challenge blog to see what the Design Team has created for you! My card base is kraft with layers of spruce and designer paper from DCWV's This Christmas stack. I used a zig zag stitch around the large layer and a straight stitch on the inner layer. I wrapped the base with Night of Navy grosgrain ribbon, then made a bow and attached with a glue dot. The image is Later Skater Ian and is cut with a nestabilities die, then mounted with dimensionals. The santa hat is cut on the Cricut using Paper Doll Dress Up cartridge. The sentiment is printed using Stencil font and punched with a 1 1/2" circle and mounted on a 1 3/4" circle, then mounted with dimensionals. It's another Friday Spyday at TGF's Farm Fresh Challenge blog. This week we spied...Danielle Daws. It is inspired from a sketch by Jennifer Schulz at Deconstructing Jen. 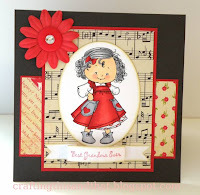 I am also entering it for this week's Anyone for Anya's Anything Goes challenge. My base is Cherry with layers of pine and designer papers from DCWV This Christmas stack. I stitched the two layers with a straight and zig zag stitches. The image is TGF's Wild Sprout Stella and is colored in copics and mounted with dimensionals. I accented it with glitter and cut the santa hat from Cricut's Paper Doll Dress Up. The letters are cut from Cricut's Doodlecharms. The sentiment is printed on cardstock and mounted on a pine scrap with a dimensional. Don't forget about the TGF 3rd Annual Customer Blog Hop! There is still 3 days left to sign up by emailing Jessica at yeahshestamps@gmail.com. Come play along with us and enter for a chance at some special treats! Monday Funday #10 - N.E.A. It's a killer challenge at TGF's Farm Fresh Challenge blog - NEA - No Embellishments Allowed! You wouldn't think this would be hard, but it's harder than you think. I am itching to grab something out of my embellishment drawer! 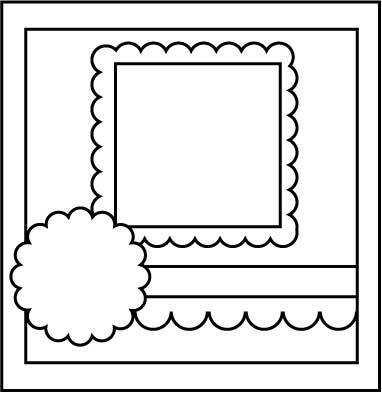 This week's Heart Journal assignment is "Dreams": create a spread based on a dream, goal, or wish. I have had some weird dreams lately, so I decided to go more broad. I started searching ideas on the internet and then looked at images. When I saw a dreamcatcher, I started looking at them specifically. Some are so simple and others are really detailed. So, I decided to use one in my design. 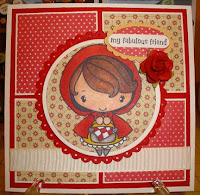 It's another Friday Spyday at TGF's Farm Fresh Challenge blog and this week's spied card is by Jacqueline. The base is cherry from Recollections with layers of Very Vanilla and DSP from DCWV's Christmas stack. The base is cut at 5.25x10.5. The cherry layer is cut at 5x5 with the squares cut at 2.25 and the DSP layer is 2 1/8 square. The image is TGF's Elf Anya colored with copic markers and mounted on classic circle and lacy circle cut with nestabilities with dimensionals. The lights are button embellishments I found at Michael's and tied with twine that was pulled across a Lucky Limeade ink pad to color it. The sentiment is printed on cardstock in Curlz font and mounted on a nestabilities diecut. FYI for 3rd Annual Customer Blog Hop! Where: TGF's Blog and on YOUR blogs! How to sign up? This is the important part, folks! 1.) Please send an email to Jessica at yeahshestamps@gmail.com with the subject line: TGF HOP (my email will be set up to 'filter' these emails into a special folder so that no names are missed- it's very important you use the words "TGF HOP". There will be TWO Grand prizes to two random hoppers that night- one for a HOLIDAY project and one for a general TGF project that really showcases your love of TGF! Come one, come all, and if you don't have a blog, that's ok too- you can use your SCS Gallery to showcase your projects, too! Please email your intent to sign up by MONDAY, DECEMBER 12th to Jessica. Out of respect for other hoppers, please also email Jessica even if at the last minute, if something comes up and you cannot participate so that I can go in and change the links so that no one 'breaks' the hop. Everyone puts in a TON of work for these events and we are SUPER pumped!